There’s a lot that goes into a screenplay. It’s not just a novel, it’s a blueprint for making the film. Because of this, it can feel like a script packs a LOT of information but sometimes its readability and pace gets lost. Once you lose the readability, you’ve lost the reader. So how do you write a more readable script that has some punchy pace? We have some tips which should guide you in the right direction. Welcome to The Film Look. We’ve spoken about this a few times now, but it’s worth mentioning again. Read the script out loud with a few friends. Give everyone a role to play, but have someone read the actions lines as well. This will give you a very clear indication if the script is easy to read. To a newcomer, all this information is brand new, so they won’t have a bias or any previous knowledge when they read it. The first thing you can do is create more white space on the pages. You should be able to scan a script and understand it in a moment’s notice. This is especially helpful during a shoot. You can create more white space by thinking of each paragraph as a beat in the film. If you have “this happens, then this happens, then this happens”, space it out and put each “THEN” on a new line. If things are happening at the same time, or within a single moment, you can keep it in the same paragraph. A good rule of thumb is not writing over 5 lines for a single paragraph. If you are taking more than 5 lines to describe something, you are probably describing too much stuff. Saying that, more words doesn’t always mean more descriptive. Want to the describe the immense gunfire and chaos from a battlefield in world war 2? “US Marines fire machine guns towards the Nazis”. The two sentences describe the same thing, but the second gives you a sense of the image and feeling in the scene. It sounds a lot more chaotic and violent due to the use of metaphors, similes, and adjectives. If you get creative, you can make your action lines paint pictures. Let us know if you have any tips for making a script easy to read in the comments below. You can hit that orange lens cap if you want to subscribe for more videos just like this one, and remember to achieve it one line at a time. 🎵 http://bit.ly/track-losinggames - Click here to download this episode's track. Check out Premiumbeat.com to discover a huge range of exclusive royalty free music! The best scripts are packed with action, drama, and compelling characters. You’ve got a bunch of characters battling their way through obstacles, both internally and externally, to achieve a goal. The very best scripts also have characters conflicting with each other, regardless of whether they want to achieve the same goal. So how do you check your script has enough drama, action, and conflict between characters to be entertaining? We have one technique which will help solve that problem. Proofreading the first draft of your script will only get you so far in working out the kinks. Because YOU wrote the script, you might not notice you’ve forgotten to include some things. Because you know the full backstory of the characters, and have a detailed outline of the locations in your mind, you will be reading your script with more knowledge than a newcomer. The easiest way to identify issues with your script is by performing it, out loud, with a few friends. Getting the script in the hands of someone else is a massive benefit as they can only read what’s been presented to them on paper. Me and Rob tried this technique using the first draft of a script he wrote, and we were able to identify a lack of drama between characters from the get-go. The script is called 60 seconds, and we will be using it as a reference for this episode. With having your friends perform the scene with you, you should be able to identify if the scene is just a bunch of characters doing and saying things, furthering the plot together, without colliding with each other. We have so many things to think about when writing a script that we sometimes forget to push the characters into EACH OTHER. This is easier to identify if you can see and hear it being performed in your living. In an earlier version of the script, 60 seconds, both Jack and Stu are driving on parallel lines: they are BOTH simply trying to defuse the bomb together. So we added a little more detail to their characters. For example, Jack would rather defuse the bomb on his own only to realise he needs Stu’s help, and Stu can’t help himself messing things up only to realise he needs to knuckle down and get serious if they want to defuse the bomb. This example isn’t super complicated, but now both characters enter the scene with different motives, characteristics, and reach an agreement at the end. If you think of the changes as converting parallel lines into intersecting lines will help you map out how the action and drama unravels. In this example, you have 2 lines, Stu and Jack, and they are on opposite sides of the spectrum. Once they break through the cross section, they are now starting to understand each other’s opinions, and they have both swapped sides. Stu understands Jack is serious about the bomb, and Jack understands Stu is only trying to help. If you want to read the first and final version of the 60 seconds script, to see how we changed it using the “read out-loud” method, you can find that in the description below. We are planning to make this film and put it on the channel, so if you don’t want spoilers, don’t read it! 🚀 http://bit.ly/tflrs-creator - Become a social media powerhouse with RocketStock's video element pack, Creator. This collection comes packed with logo reveals, end screens, subscribe animations, and much more. 🎵 http://bit.ly/pbtfl-newfrontier - Click here to download this episode's track. Check out Premiumbeat.com to discover a huge range of exclusive royalty free music! A screenplay is not only the plot of the film written on paper - it is the blueprint which the whole production team and the actors will follow, breakdown, research, and prepare when making the movie. Because of this, everything you see in the script, you must be able to shoot. For example: “Gary is nervous before his interview with Derek.” Nervousness is an emotion Gary is feeling internally. We can’t simply shoot “nervousness” because nothing is actually being outputted. Imagine you are on a film shoot and you read the line “Gary is nervous before his interview with Derek”. You then have to ask yourself “How do I show Gary is nervous?”. You have to find a way to then SHOW that Gary is nervous. Instead, try this: “Gary nervously taps on his knee.”. This is clearly an ACTION which suggests Gary is nervous. We can physically shoot Gary’s nervousness from the tapping on his knee because it is a clear indication of nervous body language. To go one step further with this rule: How much emphasis do you put on this emotion? How important is Gary’s nervousness in this scene? If his nervous feeling before meeting Derek is a critical plot or character development moment then you might want to scale up the nervous action to something bigger than tapping on his knee. The stronger you express this emotion in the script, the more the audience will pay attention to it. If his nervousness is is crucial to Gary’s character, you may want to go with Number 5. If it isn’t as important, maybe lessen the impact. Or if it isn’t important at all, don’t even write it. 🚀 http://bit.ly/corruption-pack - With glitchy overlays, distorted logo reveals and more, RocketStock’s "Corruption" is an ideal way to give your project a dramatic edge. 🎵 http://bit.ly/pb-happyfunkyday - Click here to download this episode's track. Check out Premiumbeat.com to discover a huge range of exclusive royalty free music! YOU just came up with an awesome story that you want to turn into a film. What do you do now? It’s time to get that story written on paper - let's write a script! A script (or screenplay) is the backbone of your film. It is the blueprint you’ll follow when you plan, shoot, and edit your movie. In the last episode we spoke about storytelling, structure, and using “character, conflict, goal” to craft a compelling plot. Now it’s time to put that into practice and draft a formatted screenplay. Firstly let's breakdown the elements of a screenplay using a page from our latest film BACKSTAGE. A scene always starts with a scene heading. The scene heading is there to tell you the location and time of day of the scene you’re about to read. It always begins with INT or EXT, signifying if the scene is inside or outside. Then a brief description of the location, for example, LOCKER ROOM. This is followed by the time of day: DAY or NIGHT are standard descriptions, but if you plan on shooting in a certain light, you can be more specific like GOLDEN HOUR or DAWN. Next you have action; this is where you place the narrative description of events in the scene. This is the meat of the script, so in here you can describe characters, the events, the location and character interaction. When a character is introduced for the first time, their name should be in ALL CAPS. This is to clearly identify that this is a new character who we haven’t seen yet. After that, you should use sentence case with a capital letter at the beginning of their name. Next up we have dialogue. It always starts with the character’s name in ALL CAPS in the centre of the page. Underneath you have the written lines in sentence case. We won’t be getting into the nitty gritty of margins, spacing, and indents. With screenwriting programs such as Celtx and Final Draft doing all of this for you, I won’t bore you with it. Next up we have parentheticals. These are seen as small descriptions placed between a character’s name and their dialogue inside parentheses. They have multiple uses, and all link to the dialogue being performed. They can be used to indicate where a line is being outputted, such as FROM PHONE. They can be used if a line of dialogue needs to be performed a specific way, such as SARCASTICALLY. They can also be used when a character is addressing a specific character in the scene, such as TO BOBBY JAZZLER. You can SOMETIMES use parentheticals in replace of action, such as TAKES OFF GLOVES. This should only be used if the action can be written with very few words and is delivered during the line. Otherwise, break from the dialogue and write it out as an action line. Parentheticals should be used sparingly, and it’s common to see parentheticals unused in a script altogether. If you don’t know whether to use them, just leave them out. There are a few more intricate details you can add to your script, but this is a good starting point to formatting. So now you know the basics, what's next? It’s time to start filling out the action. If you have some brief notes from your beat sheet such as “a bunch of wrestlers are getting ready for the fight” you can now turn it into something more descriptive. Just remember to avoid writing anything which is unfilmable; by this I mean anything which you can’t capture on screen. Instead of writing “the locker room smells like a boys bedroom” describe the pile of dirty laundry in the corner. Try to limit describing anything you can’t point a camera or microphone towards. And don’t write anything which jumps into the role of another filmmaker. If you describe a character’s eye and hair colour, the casting director will be limited. If you start describing all of the camera angles, you’re doing the job of the cinematographer. Once you have a finished draft, it doesn’t have to stop there! A first draft is a good starting point, but there will always be room for improvement. 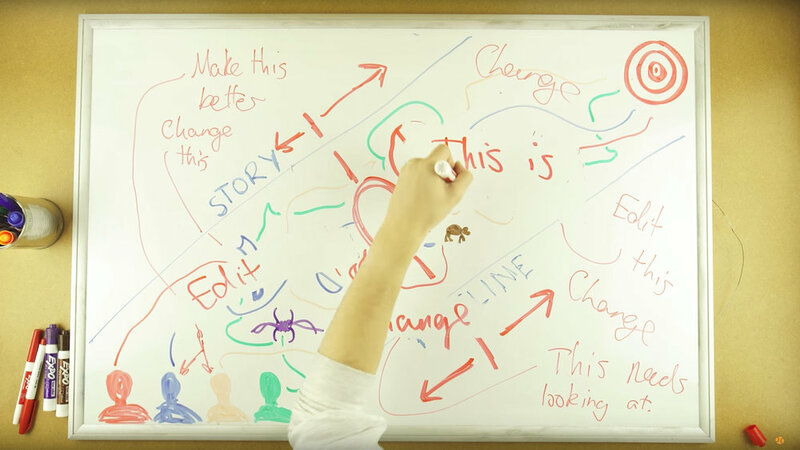 We have a bunch of videos on our channel on ways to improve your script writing. I’ve put a link to our Writing Playlist if you want to check them out. And once you’ve written your first draft, print it off, and give it to someone to read. They might notice something you don’t. 🎵 http://bit.ly/track-rollthedice - Thanks to PremiumBeat.com for sponsoring the episode! Click here to download this episode's track. Check out Premiumbeat.com to discover a huge range of exclusive royalty free music! YOU just thought of a really interesting idea for a film. What do you do now? It’s time to turn that idea into a story. A story starts with some sort of scenario, character, or moment you can see inside your head, and then expanding on it. Don’t get bogged down by formatting and complex story structure just yet. Right now all you need to do is outline the things that can happen to your characters throughout the film by making a big list of stuff that can happen. These are sometimes referred to as story beats, and listing them creates a beat sheet. Our latest short film BACKSTAGE was a product of a writing exercise we call “Story in a Can”. We brainstormed the idea on camera and outlined the beats in the episode. I’ve put a link down below if you want to watch the birth of our latest short film. Instead of trying to knock out a formatted script from the get-go, write your beat sheet and use this as a brainstorming session for developing the story. Right now, it’s all just playing around with ideas so nothing has to be concrete. Remember, you can’t edit a blank page! So now you have your basic story elements, it’s time to write up the script, right? I’d advise against this for now. At the moment you have a simplified template for your film, and swapping and changing the beats inside the template is a lot easier to wrap your head around than swapping and changing the beats inside a formatted script. You currently have the ingredients to your cake on the counter. But before you mix them together, you want to measure them out. Don’t be so hasty to bake the cake if you currently have too little flour, too much sugar, and have misplaced the eggs. There are a few simple methods you can use to make sure your film is as tasty to an audience as possible. At the end of the day, you are making this film for someone to watch and enjoy - they won’t enjoy taking a bite if it tastes horrible. The first thing I measure are the three main ingredients: “Character -> Conflict -> Goal”. This is a structure storytellers have been using for thousands of years, and without it, your cake might be too sweet or may not rise in the oven. Who are they, what do they want, and who or what is stopping them? All the tools you use to create your film; the camera, lenses, the sound, the acting, the lighting, it’s all just there to give the necessary information to the audience. 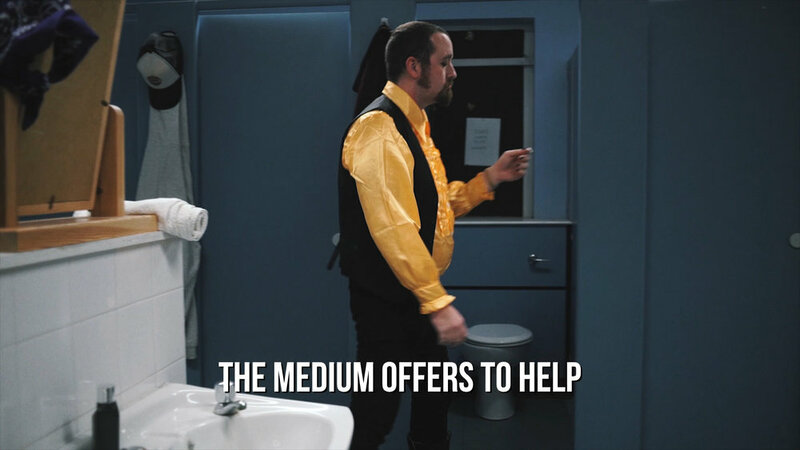 In BACKSTAGE, we tried to help the audience understand The Medium using a few methods. Firstly, his character: we are shown his pantomime-aggressive Wrestling persona in the cold open at the beginning, then we see his contrasted personality and commitment to his cause once we cut into the locker room, then when the conflict occurs, we see him rise to the occasion. He’s a character of passion, he’s heartfelt, confident, and he’s a bit weird. His goal is to fight in the ring. This is clear because he literally says it at the beginning, his face is on all of the posters, and he’s concentrating so hard as he looks at his reflection in the mirror. Everything points towards this guy being a big deal. What’s stopping him from fighting in the ring? The Flyswatter. The Flyswatter is the guy he is supposed to fight. If he doesn’t get this guy out of the cubicle and into the ring, he doesn’t achieve his goal. The Flyswatter is a little bit different. We learn about his character more through empathy than anything else. We’ve all been in a situation we are pushed into and feel trapped. He is literally boxed in a cubicle, and the over-the-cubicle shot is a deliberate choice to emphasize this information to the audience. His goal is to leave, it’s as simple as that. We know this through his negative reaction to The Medium’s tales of his past - we know this as he is quietly removing his costume throughout the scene - and we know this when he finally tells the Medium after letting it build up inside his head. Stopping The Flyswatter from achieving his goal is shame. He is nervous, he wants to leave, but at the same time he is completely ashamed to let these people down. The clock is ticking for The Flyswatter, he is given 20 minutes, and he knows with every cue of music he can hear coming from the stage that his time is coming to an end. At the end of the film we have resolution. The Medium gets to fight his final match, and he successfully convinces The Flyswatter to fight. The Flyswatter is courageous, he actually achieves his original goal of leaving, but that goal suddenly reveals itself to be more than just fleeing; it’s an internal struggle of anxiety which he overcomes in the most peculiar way. Your characters, their goals, and their conflict don’t always have to be multi-layered, perfectly crafted pieces of the plot, but without these elements at all, your film may feel alien. Film is a language, and that language derives from campfire tales and slumber party ghost stories. They all share a common tongue, and it’s up to us as filmmakers to deliver that information in an entertaining and visually-cinematic way using the tools we have available. 🎵 http://bit.ly/stanza-pack - If you're looking for stylish transitions for your video, then check out "Stanza" by RocketStock. You’ll be cutting from scene to scene like a pro with this bold pack of 200 plus video transitions. http://bit.ly/pbtrack-links - Click here to download this episode's track. Check out Premiumbeat.com to discover a huge range of exclusive royalty free music! Our latest film is based on a story we came up with in the first ever episode of Story in a Can. Here is the uncut version of us developing the idea on the spot. Over the past 5 years or so I have dedicated some serious time into trying to write more interesting stories. So I thought I’d share with YOU my top 5 tips for a better screenplay. One way you can push your script to the next level to “torture your characters”. We tend to write likeable characters in our films, which is great. But because of this, we might end up lacking commitment when giving them obstacles and struggles to overcome. So don’t hold back! If you think you can push the action or drama even further, go for it. It’s all about going big or going home! You want to give them a situation they simply can’t avoid. 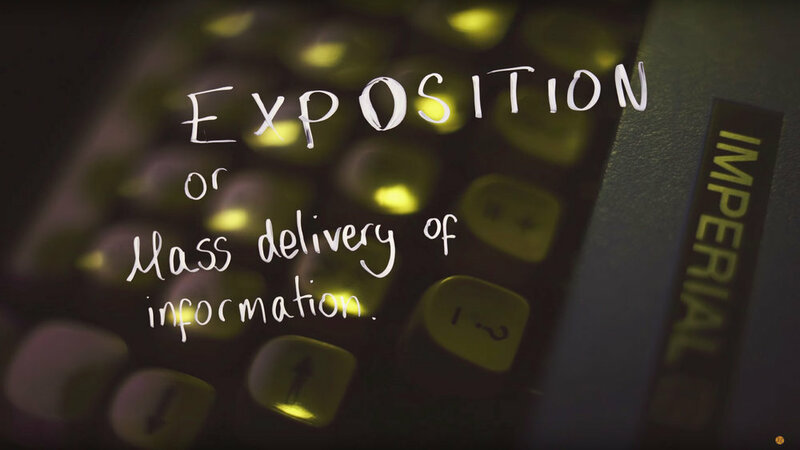 Exposition, or the mass delivery of plot information, is usually unavoidable when writing a complex film. The trick to better exposition is having a character deliver information to an uninformed character rather than telling them something they already know. It’s all about informing and educating instead of forcefully recapping on things they already have knowledge on. CSI is a prime example of bad exposition. They’ll all be crowding around a crime scene and one dude will explain the situation to a team of professional detectives who will clearly know what’s going on. A better example is Back to the Future. Doc Brown explains how time travel in the delorean works to Marty who, as a layman, currently has zero knowledge on this. When you can, show - don’t tell. Dialogue should always be the icing on the cake! A scene should demonstrate what is happening, rather than a character’s dialogue telling us. Next time you are editing your script, try turning that line of dialogue into action instead. Or instead, Jimmy could bump into Ashleigh at a party and simply can’t get a word out. The output of information to the audience is the same, but one is a lot more visually entertaining. Dream Fulfillment. The characters in your film should be doing things you wish you could do. We all daydream about situations we know will never happen, but if you put pen to paper, your characters CAN act them out. An audience will engage with a story if they are witnessing their dream being fulfilled on screen, so think about some of the quirky things you wish you could do, and write it into your film! You have things like beating up the bully, spinning webs through new york city, and winning the race of a lifetime. But they don’t have to be good - you can write more sinister situations like graffiti the boss’s car, robbing a casino, or overthrowing the leader of a criminal organisation. 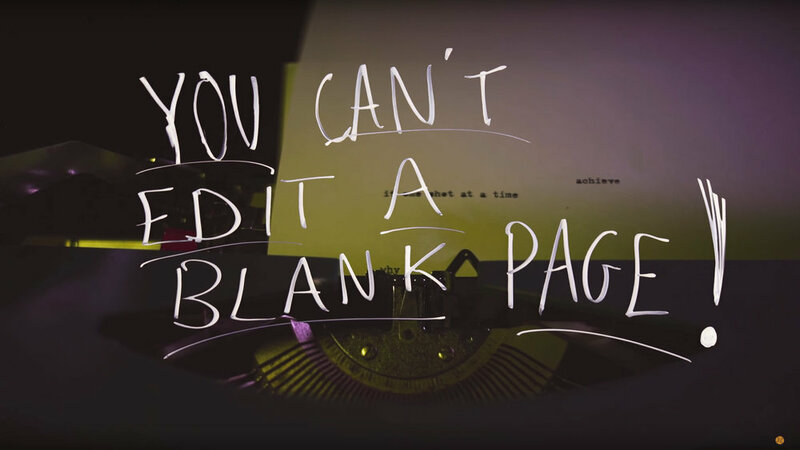 You can’t edit a blank page. Stop worrying if your first draft is total garbage! Stop hitting the delete key. Your first crack at a story is bound to be not so great. This is where the second draft comes in. Get your words on the page and don’t look back until you’ve reached the end, then you can go back and clean it up. That’s why they call it a vomit draft. http://bit.ly/interface-pack - "Interface", RocketStock's HUD element pack, offers you more than 400 futuristic elements compatible with Premiere Pro, FCPX, and AE. Discover it now! https://bit.ly/track-blue-lounge - Click here to download this episode's track. Check out Premiumbeat.com to discover a huge range of exclusive royalty free music! We sometimes find as writers that we aren't generating unique and original story lines or characters. Well, how do we write with originality?How do we write with originality? Let me show YOU one way that might work. Sometimes we find ourselves writing things that are more comfortable than compelling which leads to unoriginal and predictability. During these periods of low inspiration, the first, second, or even tenth thing we write down is comfortable and all too familiar. ”The van side door slides open and a SWARTHY CHARACTER who resembles Yasser Arafat leans out with an AK 47 sub machine gun. He OPENS FIRE. Brown: Run for it, Marty! I’ll draw their fire! It’s likely going to be something we have heard or seen before, resulting in something boring or cliche. Our natural human instinct is to find comfort. This is why we find change so difficult at times. Well I’ve recently learned of a technique that I want to share with YOU that will push against that comfort by forcing ourselves into thinking deeper. I’m going to try writing about a bank heist. How many different ways can we answer the question “How do they rob the bank?”. Out of the car, masks on, through the front door with shotguns. This is 90% of heist movies, so it’s good we are getting this out of the way! Lets keep going! Around the back, knocking out the security guard who is taking a secret smoking break. Ramming a lorry straight through the lobby window and going in all guns blazing. Hacking into the electronics at night, and robbing it under the stealth of total darkness. Waiting patiently. As a bank teller opens the security door, throw a paper airplane doused in petrol through it. Using a remote spark, detonate it, causing a small fire. The fire alarms go off, releasing the locks so you can break in. Okay, now we’re getting somewhere. Thinking of more ideas from this point is going to get harder, and that’s a good thing! Lets keep going. Drilling in from underneath the bank. The heist team all get jobs at the bank and they rob it from the inside. One of the team acts pregnant, her water breaks at the bank and must get to the hospital. But! Another member of the team backs a truck up to the doors and runs away. The manager, who can’t be dealing with this, brings the pregnant team member through the back. She knocks him out, steals his card, takes several piles of cash from safety deposit boxes, hides them in the hollow cavity of her fake pregnant belly, and escapes out of the front door via an “ambulance” which just conveniently happens to be...more members of the team. That last one might not be the greatest of ideas, just yet. But developing the idea and changing a few things here and there, you might have yourself a compelling and unique spin on a common action movie convention. This technique can work with any type of story, whether that be a piece of dialog in a diner, a morning montage, or being shouted at by your principal at school. By forcing our brains to keep thinking of more and more versions of the same scenario, we find ourselves running out of comfortable solutions, and in turn, we find originality. So next time you are struggling to write an original scenario for your screenplay, try writing a dozen and going with the last one. In fact, here is a challenge! I want YOU to write 10 different ways a character is being yelled at by their boss, and put them down below! Let’s see what we can all come up with. http://bit.ly/stanza-pack - Thanks to RocketStock for the video transitions used in this episode! With over 200 exclusive transitions, their pack Stanza can get your video looking great too. http://bit.ly/track-FunkyMoments - Click here to download this episode's track. Check out Premiumbeat.com to discover a huge range of exclusive royalty free music! Structure Your Film Like The Pros! Before I properly sit down and type out the first draft of a script, I make notes of the key events from start to finish. It usually looks like this; a beat list, which is essentially the film written in bullet points. This has worked out well so far for writing shorts. But since I started writing a feature, I wanted to see if there were any feature film structure templates, just to keep me on the right track. I came across this. It’s a list of plot points you can fill in for your film. To check if it worked, I decided to throw in some classic films and find out if they followed that structure. They did…all of them did. Every single film I tested followed the same pattern in some form or another. So let’s talk about it! This is where your film starts. It will show your main characters going about their usual lives, sometimes quiet boring. In Back to the Future, Marty is a high schooler in the 1980s. In The Matrix, Neo’s ordinary world is actually inside The Matrix, which is a fun twist on the structure. This is an event which changes the character’s ordinary world. It shakes up what they are used to. In Back to the Future, Marty sees Doc get shot. That’s not ordinary! In Breaking Bad, Walter White finds out he has terminal cancer. Now that their ordinary world has been flipped, our character must decide to take action, going against their natural instinct. Walter White in Breaking Bad can’t pay for his cancer treatment. His call to action involves making a lot money, fast, to leave to his family after his death. This causes him to get into cooking meth. The call to action can be as simple as starting a band to impress the girl, like in Sing Street. But your character may refuse their call to action. They might not be ready for the world to change. In The Lion King, Simba refuses to go back to pride rock to stop Scar until a second incident sparks his destiny. Refusal of the Call doesn’t have to be a straight up refusal either. Sometimes it is undiscovered or misdirected. Peter Parker got his superpowers and his first call to action was to try and win money wrestling. He didn’t discover his true call to action until his arrogance got his Uncle Ben killed, which brings me onto the next thing. With Uncle Ben dying because of Peter’s actions, his personal blame gives him his reason for putting on the mask and becoming Spiderman. Just like the ordinary world in act 1 this can mean many different things. The new world to Neo is the dystopian future, “the real world”, where humans are fighting machines. To Walter White, it is the drug world. To Will in Good Will Hunting it is the academic world. Within this new world they are committed to the task at hand, for now. In this new world your character will be introduced to new people. In Gladiator this is when Maximus meets the other slaves for the first time. In Back to the Future, Marty is meeting his Mother and Father in the 1950s. And in Cars, Lightning McQueen meets the folk of Radiator Springs. The hairy mentor is someone who will guide your character through the next stage of their story. In Rocky it is Mickey, then Apollo. In The Matrix, it is Morpheus, Batman it is Alfred, Dumbledore, Gandalf, Red in The Shawshank Redemption…the list goes on. They don’t always have to be hairy, but they are likely older and wiser than the protagonist. Your character needs to be challenged internally and externally throughout the film. Some battles they will win, some they will lose, but it’s all preparing them for what is to come. This could be the point where the new people in your characters life meet the people from their old world. In Silver Linings Playbook Tiffany introduces Pat to her sister which does not go so well. In a sports film these are not just the game’s leading up to the championship game, it’s all of the training montages beforehand, and the school and family challenges they are having. The pressure is now building up on your character and things are spiralling out of control. In The Lord of the Rings the burden of the ring is getting too much for Frodo. In Back to the Future time is simply running out. This is a point in the story when a character is backed into a corner and has two options – fight or flight. In Stand by Me, this is when Gordie and Chris finally stand up to Ace. In Toy Story, this is when Buzz has been strapped with a rocket and Woody teams up with the freaky toys to save Buzz and scare Sid away. This is the part when the characters achieve what they originally set out to get. A lot of the time, their original goal isn’t what they want in the end as they grow through the journey of the film. In Stand by Me, they find the dead body of Ray Brower, but soon realise it wasn’t what they were expecting. In Back to the Future, Marty seizes the trophy by making his parents fall in love so he doesn’t disappear. At this point your character has given up and revert back to their original life, or is forced to re-live their previous life before their call to action. They are given an epiphany moment and grow back stronger than ever before. In Inception, Cobb is forced to return to Limbo where he and his Wife Mal once built their own world. In La La Land Mia gives up and heads back to her parent’s home after her stage play fails. This is where your character will win everything they have always wanted, or realise that their life was better off before. In Good Will Hunting, Will realises if he wants to get the Girl he has to leave his current life behind. In a super hero film, they always save the world. And the final battle in every sports film is either them winning or losing the championship game. In Toy Story, the final battle wasn’t actually saving Buzz from Sid. It was when Woody and Buzz needed to catch up to Andy’s moving van, or otherwise they would be lost forever. In Back to the Future, after Marty gets his parents to fall in love, he must get back to the DeLorean before the lightning strikes to get back to 1985. Your character has returned to their original life, but they have grown through the journey of the film. This last scene tails off the film, and gives the audience a black and white contrast of the protagonist, where they came, who they were, and who they ARE now. You don’t have to follow these points to the letter. The character in your story may never need meet the Hairy Mentor or get Chased Back Home. This classic plot structure template gives the audience a familiar flow, but once you know the rules, you can always break them. Writers block can happen to the best of us. We don’t know when it will happen and we can rarely tell when it will end. But there are ways to tackle writers block, and one in particular is by forcing creativity using some sticky notes, an online word generator, and a little imagination. Like we say a lot of the time, getting the film look is more than just camera settings and fancy shots. If your film doesn’t have a story, it won’t feel like a real film, and if you are struggling to get ideas for a story, you can use a technique we call “Story in a can”. It’s a simple trick. You want to create 4 categories; character, location, object, and scenario. Using an online word generator, write out 20 of each category onto some paper, fold them up, and place them into some sort of container. We used 4 tin cans and labelled them. Then it’s a case of picking out one bit of paper from each can and creating a storyline using each category. If every unique combination creates a different story, 20 to the power of 4 gives us 160,000 combinations…we think! We’re probably wrong, leave us a comment with the right answer. Each item doesn’t have to be super detailed. We stuck to a few bog standard occupations for characters like teacher, bartender, and bank manager, and added a few obscure ones like medium and funeral director. The locations were things like public toilet, a beach, and a supermarket. The objects were things like matches, a fork, and added some more complex ones like somebody else’s wallet. And the scenarios we wrote down were things like a job interview, nana going mental, an eating contest, and an exam. By keeping them a bit simple, strange, and vague, it gives you more blanks to fill in and stretches your creative muscles. Sometimes combinations can be difficult, and if this happens, you can always cheat a little bit. For example, if the location you picked was a mountain top but it didn’t fit very well with your other items you can always say it’s a restaurant named the mountain top. Use the notes however you want to use them. The story ideas you come up with might not be very good and you might just overcome writer’s blocks with this exercise. There is always a chance you might stumble on to your next script idea. We actually did this technique for a vlog episode which is linked on screen and down below. We thought it was an awesome idea and wanted to share it with you! Editing your script when it has an excess of 20, 30, and 40 pages can be really difficult to wrap your head around. You now have so much content in your script that making changes to plot points or character tweaks feels like you're biting off too much in one go. Wrapping your head around everything all at once is a mind melting task. So I needed to come up with a way that helped alleviate some of that mind melting. I call it: The Coffee Filter Method. Let’s say you have 4 main characters. They all have their own character arcs in the story line, and the main plot that drives their actions has 6 unique instances. At this point, if you want to change something half way through, there are a lot of points that will need altering on each side of this scene for it to make sense. Making this change just got really complex because it really isn’t just this scene you'll need to edit. First of all, make a list of all of the changes you want to make. This can be altering lines, changing the action, or even continuity issues like “what is this guy doing when the other dude is over there?”. Now they are all in a list, pick one and write it at the top of each page as you read through the script. You want to read through your entire script only thinking about the change that you’ve chosen to write at the top of your page. Make that change and start over with another task on your list. This method isolates all of the other complications you might have and gives you a single goal. This might seem like a more time consuming method compared to tackling everything head on, but, at least for me, it removed that horrible dark cloud in my head and let me concentrate on the single task at hand. Are these characters being tortured? Are they hitting rock bottom? Does every scene change, turning from peace to violence? Does every character have an independent activity in the scene? Get them to do something! What is this line of dialog providing? If it was taken out, would this scene still make sense? Are there any lines of dialog that can be replaced with action? So next time you are tackling a massive script and don’t know where to start, try looking through a filter. Hot Seating is an activity used in drama where an actor will assume the role of a character and is then asked a series of questions about their background, behaviour and motivation. Here is how we use this technique to shape a personality around our characters. It works like this: as the writer, get yourself in the mindset of one of your characters. If you can perform the character's mannerisms, even better! Next, ask a friend to fire off a list of questions about your character's personality traits, habits, and skills. We found a great list of prepared questions online; you can find the link to the list in the description. Here are some of the questions we asked to develop our character for our film Keep The Change. Make a note of the answers, either by writing them down or recording the session. You can come back to them at a later date. Maybe you are stumped as to what your character will react like in a particular situation. You might already have the answer in your list. We've used this technique in the past to flesh out characters, and we found that you learn more about your character than you'd even expect. Answers seem to erupt out of nowhere. It isn't necessary to answer hundreds of questions about your character. This technique is used for you as a writer to get to know your character better. Once you feel you know your character better, it's time to start writing. If you want to watch the full hot seating session with Rob you can find that video below.